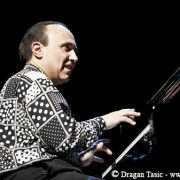 Video interview with the pianist who talks about playing with his new trio, solo and with large ensembles. During the 2011 Newport Jazz Festival, JazzTimes set up a make-shift video production studio backstage inside the old barracks of Fort Adams. During two afternoons, a succession of artists-including Hiromi, Esperanza Spalding, Ambrose Akinmusire, Anat Cohen, Steve Coleman, Mostly Other People Do the Killing, Trombone Shorty, Miguel Zenon and many others-came in to talk about the festival, jazz education and their own projects. We will be posting these interviews at jazztimes.com over the next few months. You can also see more of these video interviews at the JazzTimes YouTube channel. In this interview from the Newport Jazz Festival, Michel Camilo talked about his long history as a performer at the festival. He also talked about playing solo, with his trio and with big bands and orchestras. These videos were recorded by Melissa Mergner.